These days, most people know what Chipotle Mexican Grill is. Food safety issues aside, Chipotle serves fresh Mexican food that you make your way, choosing your own ingredients and toppings to make what you want the way you want it. Years ago, I had read that the founder of Chipotle, along with a celebrity chef that I really like, had come up with a concept for a new casual dining concept that was similar to Chipotle, but for Southeast Asian food. Seeing as I’m Thai, this was right up my alley. So, as soon as I heard of this place, I told my husband about it right away, and told him we’d have to go. Unfortunately, the first location of this casual dining restaurant opened up in Washington, D.C., all the way on the other coast from where I live. I guess I’m going to have to wait until it comes to Los Angeles. Lucky me, fast forward a few years, and one of these restaurants finally opened up not more than a few miles from my house. So of course, I have to drag my husband down there to give it a try with me. 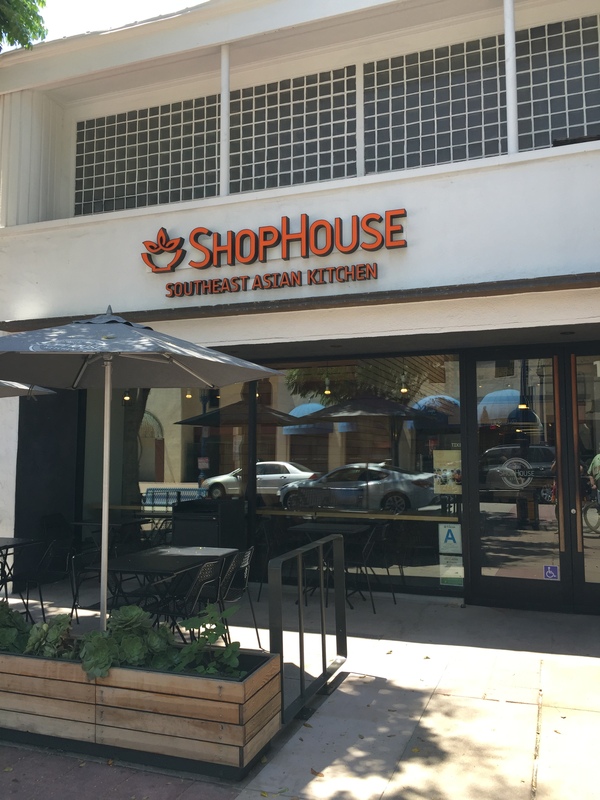 ShopHouse Southeast Asian Kitchen uses the traditional cooking methods and flavors of Thailand, Vietnam, Malaysia and Singapore and uses responsibly sourced and fresh, local ingredients to create fast, flavorful and delicious meals the way you want it in a casual dining experience. 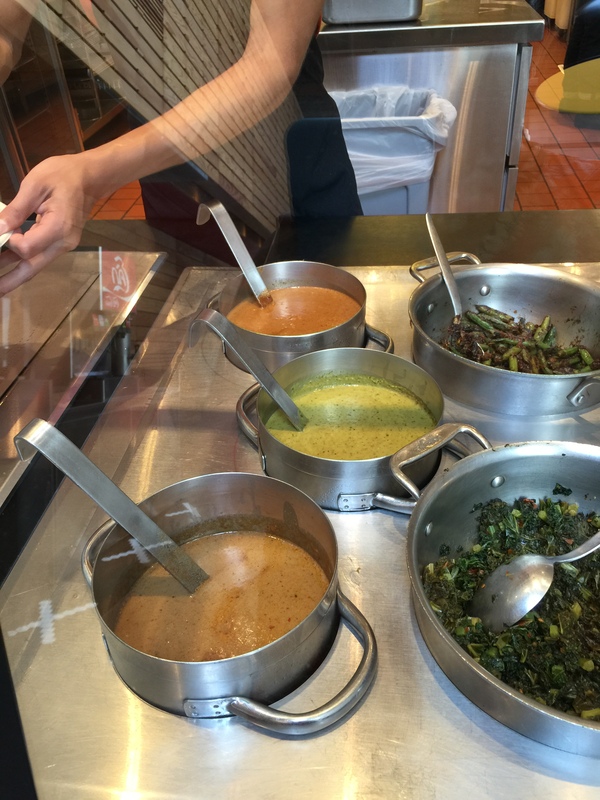 It’s exactly Chipotle, but for Southeast Asian food. Part of the mission of ShopHouse is to be responsible in the way that ingredients are sourced and cognizant of where they come from and how they are processed in order to deliver to the customer the highest quality product available at an affordable price. 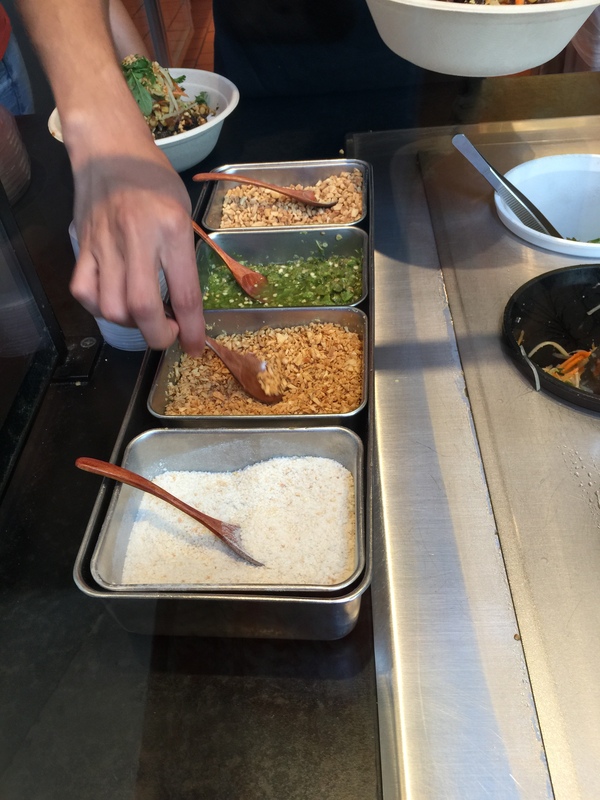 With a wide variety of ingredients, options and choices, you could go to ShopHouse hundreds of times and never get the same exact meal from one visit to the next. 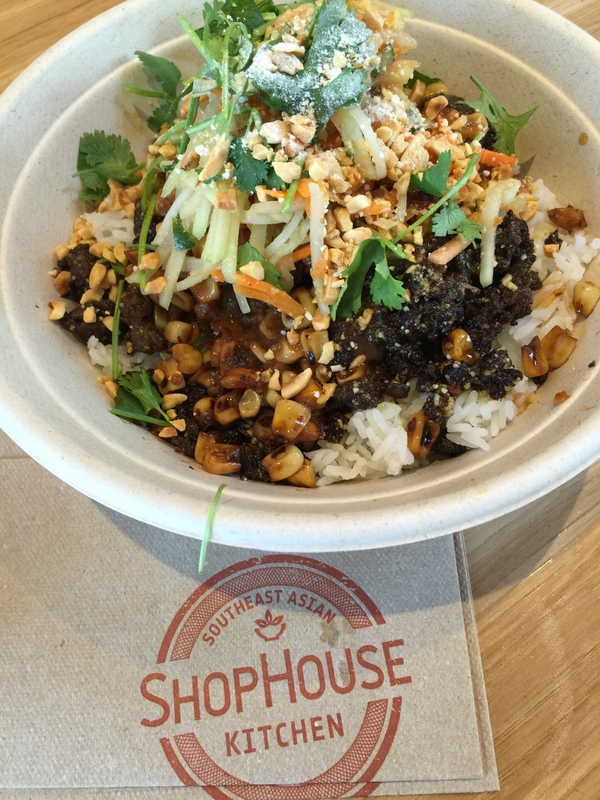 As soon as you walk into ShopHouse, you’re faced with a variety of choices. 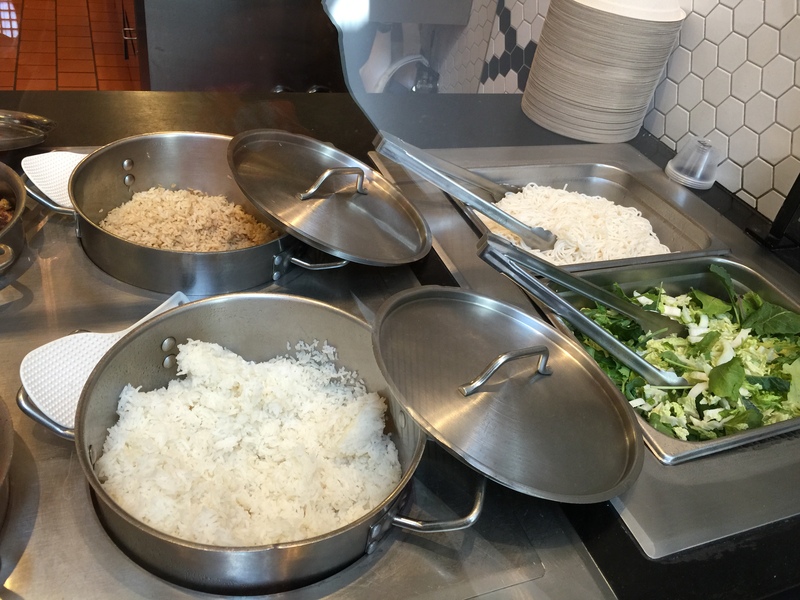 Do you want a salad, or do you want rice? Or what about noodles instead? 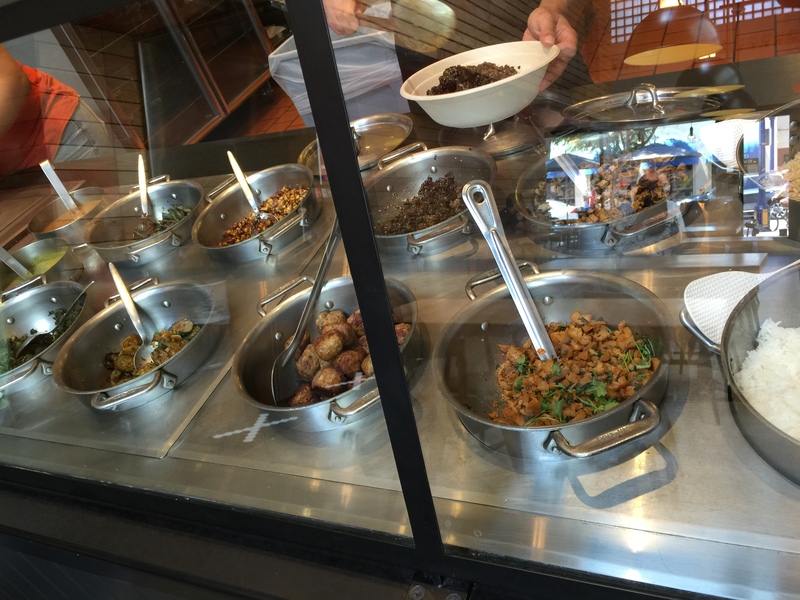 Sometimes, these choices can be daunting, so the restaurant does offer a variety of “favorites” that are essentially meals that take the decision-making out of your hands as all of the ingredients have already been chosen for you, the meal just needs to be made in front of your eyes. But, if you’re adventurous enough, you can make your own meal, using only the ingredients you choose for a meal the way you like it. The first step is choose between a bowl with rice, noodles or salad. The salad is a baby kale mixed with crunchy and slightly sweet Napa cabbage. Napa cabbage being a favorite leafy green commonly used in Southeast Asian cooking. If salad isn’t to your liking, the chilled rice noodles are a refreshing compliment to the hot vegetables and the heat-packed sauces. Or, if you want the traditional Asian rice bowl, you can choose between white jasmine rice, which is what is most commonly found in most Southeast Asian kitchens, or the healthy brown rice with its subtle nutty flavor. After choosing the base, it’s time to move on to the protein. For those who aren’t meat lovers, or what something a little different, there’s organic tofu, again, an ingredient commonly found throughout Southeast Asia. The tofu is from Hodo Soy Beanery and is cooked with ginger, tamarind and cilantro to add a punch of flavor. A favorite is the grilled chicken satay made using responsibly raised chicken which is marinated overnight in coconut milk, lemongrass, spices and herbs before it’s grilled and served. The steak option is a grilled steak laab, again using responsibly raised steak which is rubbed with dry spices, and grilled with lime, fish sauce and toasted rice; all the traditional flavors of Southeast Asia. The last protein option is pork and chicken meatballs. Once again, these use responsibly raised pork and chicken mixed with fresh herbs and roasted until golden brown. Now that your bowl has been created with a base and then some protein, it’s time to add the vegetables. There are several different options here, one of which is a seasonal option that changes from time to time. There’s kale with preserved chilies and vinegar to add a bit of punch and spice. There’s charred corn with garlic and sesame for some sweetness. Summer squash and Thai basil with garlic, chilies, and fresh Thai basil. And the last option when we were there was green beans roasted with chili jam and crispy shallots. At this point, it’s all about the finishing touches now, and that starts with sauce for your bowl. Whether you’re having rice, noodles or salad as a base, you need a little sauce for flavor and there are some great, classic Southeast Asian flavors being offered. There’s a green curry sauce made with coconut milk curry that has both sweetness and heat. For those that really love the heat there’s a spicy red curry which is a coconut milk curry that gets its serious heat from fiery chilies. You can choose a classic peanut sauce which is a mild sauce made from roasted peanuts, coconut milk, lemongrass and palm sugar. And finally, for a very classic Southeast Asian flavor, there’s a tamarind vinaigrette which is both tart and sweet from combining tamarind with lime and ginger. It’s time to add just a touch more flavor to the bowl by choosing what ShopHouse calls their “garnish.” A little added oomph packed with flavor and texture. Your choices include a green papaya slaw made with chilled green papaya, carrot and cucumber all tossed with peanuts, lime juice, tamarind and fish sauce. For something a bit milder, there’s an herb salad which uses a combination of cilantro and Thai basil, classic Thai flavors. And finally, there’s pickled vegetables which include daikon, carrot, and cucumber in a tart and tangy Singaporean-style brine. See what I mean, the possibilities are limitless as to the different creations you can create. Last step in the process now is to “top it off” as they say at ShopHouse. This step really is a Southeast Asian way or preparing dishes, you put the whole dish together, but yet it needs just one final touch, that extra something special that send the dish over-the-top. In this case, you don’t have to choose just one item, you can choose as many of the finishing touches as you want. These toppings include toasted rice, crispy garlic, crushed peanuts and Thai chilies. Now you’ve got your bowl and your on your way. But before we get to the food, I’ve got to mention that inside the ShopHouse we visited, you can choose to order a fountain soda to accompany your meal. Normally, I’d never mention this, except that as soon as I saw the fountain soda machine, I just had to snap a picture. 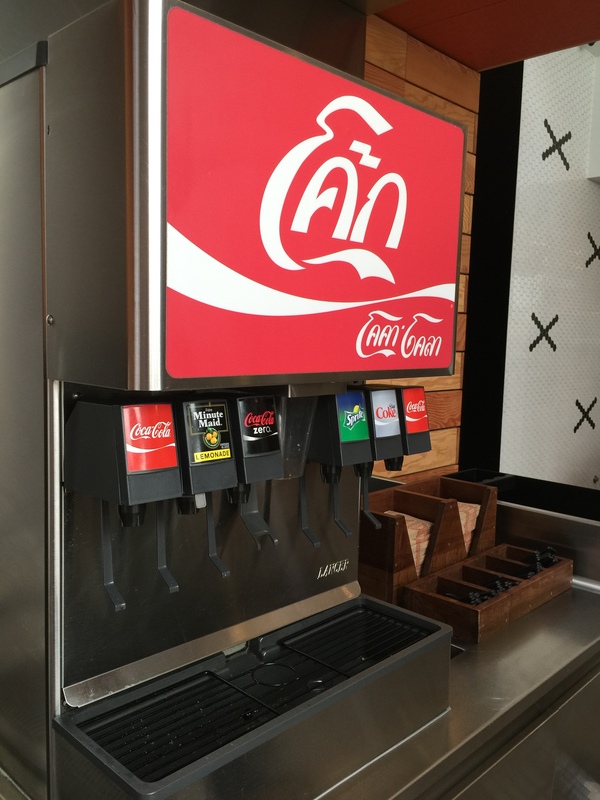 As part of the decor of making you feel like you’ve stepped into a Southeast Asian kitchen or restaurant, the fountain soda machine is exactly the kind you’d see if you stepped into a restaurant in Thailand. In fact, that machine doesn’t say “Coca Cola” as you’d expect, but rather that’s written in Thailand it says “Coke” in Thai. I thought that was so neat as I’ve never seen this kind of fountain soda machine outside of Thailand before. Funny, there are hundreds of different combinations of bowls that can be made from the choices available, and yet, my husband and I make almost the exact same bowl. We must have more similar tastes than we realized. I was looking for a hearty bowl, so I chose a traditional jasmine rice base for my bowl. My protein choice was the grilled steak laab. I am a steak and potatoes kind of girl, after all. My vegetable choice was the charred corn with the tamarind vinaigrette sauce. My garnish was green papaya slaw and I topped it all off with the green papaya slaw. For the final finishes, I added the toasted rice, crispy garlic and crushed peanuts. This is the only place my husband and I differed on our bowls, he chose not to add the toasted rice to his bowl. We both loved the flavor of our bowls. It’s no surprise that with so many different ingredients you can add to the bowls that they were packed full of amazing flavor. The tamarind sauce was both sweet and tangy. The charred corn was amazing, adding a bit of sweetness, but with that wonderful char flavor. The grilled steak laab was so fantastic as it was jam packed with flavor in each little bite due to being marinated overnight prior to being grilled. The jasmine rice was cooked well and really created a hearty meal, and since jasmine rice on its own is a bit bland, all the flavors added to it and mixed into it really gave it some oomph and flavor. The green papaya salad added nice crunch and freshness to the bowl. And the finishing touches of the peanuts and crispy garlic and toasted rice added even more texture and flavor to the overall dish. This really was the flavors of Southeast Asian all rolled into a bowl that I was able to create myself only using the ingredients that I wanted to eat and enjoy. ShopHouse is such a brilliant concept, I’m surprised it’s taken this long for someone to introduce it, and now that it’s here, it’s really been done the right way. My husband and I have loved it so much that we’ve been back a couple of times since our first visit. It’s a quick, easy, and affordable meal featuring flavors that we just can’t find anywhere else in a fast, casual dining setting.